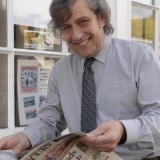 A long-serving editor has retired after 18 years in charge of a weekly newspaper to be replaced by its chief reporter. Graham Smith, pictured left, has left the East Kent Mercury after overseeing 2,000 editions in a journalism career spanning five decades. Cancer survivor Graham took over the KM Group-owned Mercury, which celebrated its 150th anniversary last year, in 1998. He will be succeeded by its current chief reporter Beth Robson. Said Graham: “Doing this job has been a real pleasure and a privilege. East Kent is a fabulous community to serve, full of wonderful people. Graham started his career in 1973 on the Acton Gazette in West London, where he comes from, moving to Kent in 1977. He had spells on the Folkestone Herald and Dover Express, latterly as deputy editor, the Kentish Express and the Kent Evening Post, and was editor of the travel trade publication Travel GBI for four years. Before joining the Mercury, he was editor of the Whitstable/Herne Bay Times. The biggest stories covered by the Mercury in Graham’s time have been Deal Town FC winning the FA Vase – the only Kent football club to do so – in 2000, and Pfizer announcing it was pulling out of its Sandwich base in 2011. Graham underwent an operation for prostate cancer at Kent and Canterbury Hospital in September. It was his second operation for cancer at the hospital, following surgery for bowel cancer in 2008. The keen walker now hopes to undertake more fundraising for PSA (Prostate Cancer Support Association) Kent, which was the Mercury’s charity of the year in 2015. Graham said: “Both my cancers were detected early, the operations went well and I’ve recovered fully. So I’ve been very, very lucky. great, positive story, though pity the industry is losing another experienced editor. Good luck to him. Good health and good luck in your retirement Graham. It’s a great paper on a great patch. Sure Beth will follow wonderfully in your footsteps. Wishing you a long and happy retirement, Graham. And best of luck to Beth in the editor’s chair. Good to see a weekly that still has its own editor! Best of luck to the new boss. And best wishes, too, from your former Folkestone Herald colleague, friend and flatmate, with a multitude of memories to dredge up over a drink (or several) sometime soon, I hope. Graham was an old-school editor, proud of his lovely paper, his staff, his community and his journalistic principals. I helped cover for him during his first cancer battle. He just couldn’t wait to get back to work. This is anything but a premature obituary tribute – Graham is full of beans and can walk most people off their feet. He deserves a long and happy retirement – and good luck to Beth who will fill his boots in a community which continues to expect a lot from its local paper. Well done Graham. You managed to escape on a high before Trinity Mirror sniffed you out and vaporised you like the rest of the country’s decent editors!